Since our founding in 2002, Arezzo Jewelers has established itself as Chicagoland's Premier Italian jeweler. Arezzo Jewelers is named after the city of Arezzo, a historic Tuscan city in Italy. The Spilotro family has a reputation for providing excellent customer service and the finest in Italian jewelry. We here at Arezzo Jewelers strive to offer you the highest quality and the latest trends in Italian Jewelry for the best prices in Chicago.Designer Jewelry - Designer Watch Lines - Diamond Engagement Rings - Loose Diamonds & Gemstones - Fully Custom Design Options. Full Jewelry and Watch repair service! Established in 2002, Although in the jewelry industry for nearly 30 years, we reopened in 2002 under a new name, Arezzo Jewelers. 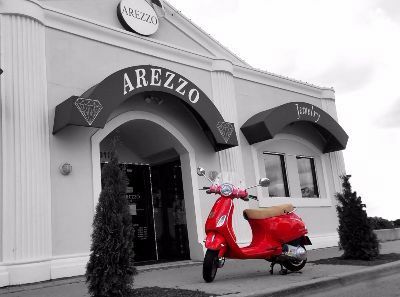 Arezzo Jewelers is named after the town Arezzo, located in Tuscany, Italy. Arezzo is well known as the "Gold Capital of the World", and here at Arezzo Jewelers we do our best to have our customers experience Arezzo first hand. We are a family-owned and operated and Strive for the best customer experience. Meet the Manager: Vincent S.
I have been working here with my mother and father since 2002. My father Michael Spilotro, being in the business for nearly 30 years, showed me what it takes to have a business that reflects the traditions and values of our Italian culture. I learned that this business is more that the products you sell, it is the relationships you maintain with your clients on a life long basis. We offer an experience along with our Jewelry and Gifts, and that is what keep people coming back.